The Manchester Terrier: Sleek, lively and alert. The Toy Manchester Terrier (MT) was once an excellent ratter, ridding the Manchester part of England of all its vermin. Nowadays, this breed has all but retired from that role and now enjoys the life of a real canine companion. He is alert and often wary of strangers—two traits that make them excellent watchdogs. Being a terrier, these dogs are likely to be diggers, talkers, chasers and possessive of their belongings. Most terrier breeds have these inborn characteristics - “hunting tendencies” to one extent or another. 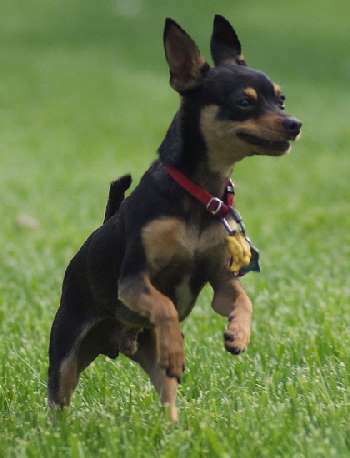 A cross between either a Whippet, Italian Greyhound, or a Greyhound and the Black and Tan Terrier created a dog that was larger than today’s toy. Initially, they were used in the poor man’s sports of rat killing and rabbit coursing. Since the small size became fashionable about the time of Queen Victoria reign, breeders worked hard to minimize their size. First, the Manchester and the Toy Manchester were two separate but interbreeding varieties. Both sizes of the MT remained separate breeds until 1959 when the AKC combined the two creating the Toy and the Standard. The sole difference between the two sizes is the size of course and the ear shape. According to the American standard, the toy must have naturally occurring erect ears. Cropping is not allowed. The standard can have the naturally erect, cropped or button ears. 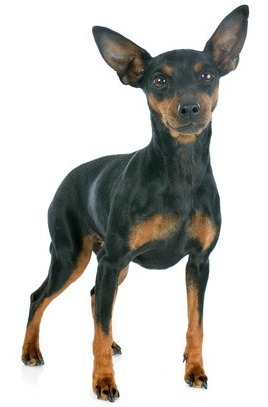 The larger Manchester Terrier can be between 12 to 22 pounds at maturity. The smaller or Toy weighs in at less than 12 pounds. In England, the Kennel Club puts the Manchester into the Terrier Group and English Toy Terrier is in the Toy Group. Most of the other registries such as the AKC, CKC, and NZKC classify both the standard and toy together and place them in the Terrier Group. Even though these two breeds look alike, have similar colours and were bred for similar purposes, both are distinctly different breeds. Manchester Terriers, as I just mentioned came from a region in England. Miniature Pinschers, on the other hand, originated in Germany and share an ancestry with Dachshund, Italian Greyhounds and German Pinschers. Both breeds look like they have similar colours but when we look closely, there are differences. Manchester Terriers are black and tan and these colours do not run into each other. They have tan spots over their eyes and tan spots on their “cheeks. Their muzzle is tan and the tan forms a V-shape on their throat. Miniature Pinschers can look exactly like a MT but can also come in different colours. There are differences in the personality of the two breeds. Both make excellent watch dogs, love and are entirely devoted to their owner. The big difference lies in the activity or energy level of the two. MTs enjoy a good jog and will accompany you anywhere on a long hike. Miniature Pinschers need exercise too, but they are just as happy to curl up on your lap, making them a better choice for couch potato owners. Terrier breeds have plenty energy and the Manchester is no exception. They love to play, chase, fetch and take walks. They are alert and intelligent making them quick learners. Fun, positive, sensitive training is essential with these guys because they are not going to tolerate any abuse. They are an exceptionally smart breed and learn quickly. Since they are devoted to their owners, training is usually easy. Of course the down-side to a highly intelligent breed is that the owner must not fall into the trap of being outsmarted by a canine! Potty Training can be more challenging. Small breed dogs tend to be harder to housebreak than medium or large breed dogs and the Manchester is no exception. 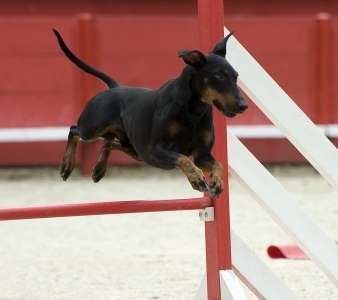 Consistency is a must for achieving a completely house-trained Manchester Terrier. They are also extremely athletic, so naturally they excel in agility and other dog-related sports. These dogs make excellent watchdogs. They are alert and are not shy at sounding out the warning if they see, smell or hear something. They are wary of strangers and devoted to a family making them an excellent choice for someone who needs a little extra protection. 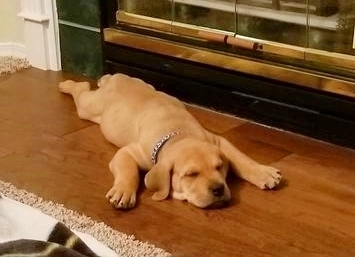 They are not likely to do any real harm to intruders due to their small size, but their bark may be enough to prevent would-be intruders from entering. This breed is a breeze to groom. 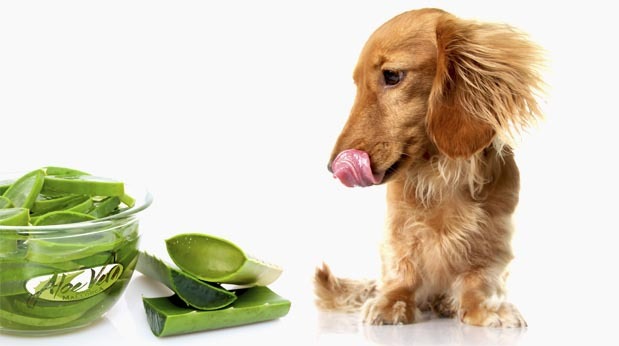 With such a short coat, bathing is a snap and air drying are all that is needed. A quick brush through with a rubber curry brush will loosen any dead hairs although these dogs do not shed much. Leggs-Calves Perthes occurs when the bone that makes up the ball portion of the hip joint is damaged from a lack of blood supply. 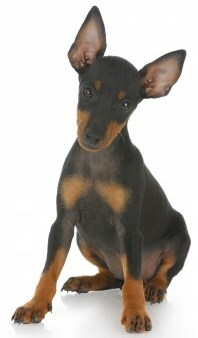 This is common in many small breeds but also occurs in both the toy and standard Manchester Terrier. This can show up as early as four months, but usually it begins around 6-9 months of age. This term refers to an inherent disease within the muscle tissue of the heart. This particular set of problems in the heart seem to be unique to the Manchester Terriers, and affects the dog at a young age. The symptoms come on suddenly and are fatal. Research is being done with the hope of developing a genetic test that breeders can use to prevent this illness. Click on the images below to find out more information about these great resources.